…Bocelli’s signature song, done with the incomparable Sarah Brightman. Posted in Music, Uncategorized. Tagged Andrea Bocelli, Con Te Partiro, Sarah Brightman. I highly recommend watching this on full screen mode. This video is all over the internet, but, being the fireworks fan that I am, I had to post it here as well. 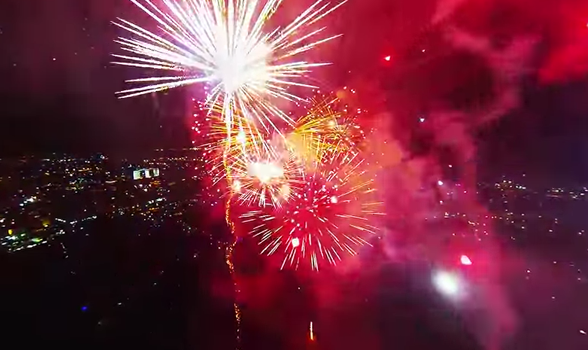 The video was shot by a GoPro camera mounted on a DJI Phantom 2 drone, flying inside a fireworks display in West Palm Beach, FL. This was a huge show, and must have been impressive from the ground, but it is magnificent in the air. The music is, of course, Con Te Partiro, by Andrea Bocelli. Posted in Uncategorized. Tagged Andrea Bocelli, Con Te Partiro, Dji Phantom, Drone, Fireworks, GoPro.